Clearwater Landscape & Nursery is a licensed construction contractor offering extensive capabilities with all types of building and masonry projects. With expert in-house design services and the industry’s most experienced and skilled tradespeople, we can build any type of hardscape feature, wall, or walkway imaginable. Plus, with access to an extensive selection of materials, including the very latest in stonework, brick, and pavers, we’re able to achieve any aesthetic style you could envision our signature long-lasting quality. There’s no better way to enhance your enjoyment of your back yard than adding a new custom patio from Clearwater. We are capable of designing and building patios of any size, shape, and configuration to match any home’s decor. Plus, with a huge range of natural and engineered stone, brick, pavers, and tile available, we can build a patio to suit just about any budget as well. 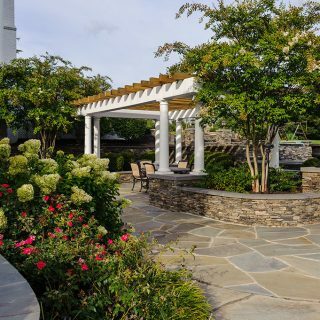 Plus, we can combine a new patio with cohesive landscaping and all types of other outdoor-living features as well, from pergolas to outdoor kitchens, fireplaces, matching pool decking, outdoor lighting, and beyond. Looking for a proven way to make a great first impression to your visiting guests and family? There’s truly nothing like the experience of arriving to a beautiful custom driveway and walkway from the team at Clearwater. Using anything from natural stone to brick or pavers, we can design and build your new driveway and walkways for a premium appearance that lasts for decades. Enhance your home’s curb appeal and your property’s value with our premier stonework and masonry expertise. Clearwater is extensive experience building all types of stone, brick, and mortarless walls for a variety of applications. 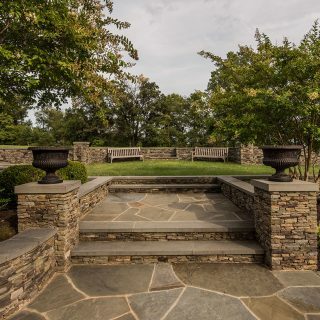 Whether we’re building an understated retaining wall to enhance your yard’s grading and drainage or beautiful, artistically curved stone walls to accentuate your landscaping, rely on our team for quality construction and an elegant look. We can even surround your patio with attractive low walls that also function as benches, providing extensive seating for your backyard gatherings. 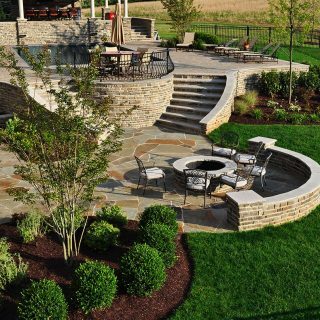 When it comes to your landscaping and retaining walls, if you can dream it, we can design and build it. At Clearwater, we have experience designing and building all types of masonry monuments, from simple pillars all the way up to large stonework signs that adorn the entrance to exclusive neighborhoods. Many clients choose the premium look of stone or brick pillars with integrated lighting at the ends of landscape walls or flanking the end of their driveways. Whatever your monumental vision, we have the talented designers and experienced tradespeople needed to bring it to life. The Clearwater team has selected photos from some of our favorite completed hardscaping projects throughout our region over the years. Click below to view our construction and masonry gallery and learn more about our capabilities and experience.